Sometimes, the time comes when you need to put your money where your mouth is. Steiner Electric did just that when it matched a 20kw Kohler generator that it distributes against a higher kilowatt-rated competitor’s generator in a head-to-head, Live Load Test. 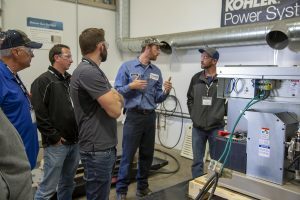 The Kohler generator came out on top in this live test performed in front of several residential Kohler Dealers at recent Annual Power Systems Kohler Dealer Conference. The Kohler 20RESD generator uses the PowerBoost feature that improves power quality for everything from small components to large appliances. To make this a fair test, the two generators were subjected to the same parameters. Both generators were hooked up to the same gas supply line and pressure. Both generators ran at 240 V and 60hz, and both generators had the same block load applied of 70 A per phase. The result of the comparative test showed that the Kohler generator outperformed the competitor’s model. This despite the competitor being rated at 22kw for propane and 19.5kw for natural gas, while the Kohler model was rated at 20kw LP and 18kw NG. An average house supplies 120/240V and 60.0hz. House lights, refrigerators and washing machines run at 120 V and 60hz. Air conditioners, electric dryers, electric stoves, and well pumps ideally run at 240 V and 60.0hz. So, the closer the voltages are kept to the 120/240V and 60hz, the longer appliances will last. When selecting a generator, you must calculate the essential wattage requirements you wish to use during an emergency utility outage. 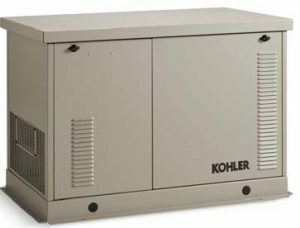 Your total wattage requirements will determine which Kohler residential generator set system will best fit your needs. In doing so you also need to carefully review inductive and resistive loads of all your appliances. Most appliances require more current to start (inductive loads) than to run (resistive loads) therefore when large appliances cycle on and off, they can create a surge in demand for power. Kohler home generators provide better voltage and frequency regulation along with ultra-low levels of harmonic distortion for excellent generator power quality to protect your valuable electronic due to the use of the PowerBoost ʳ Technology. This feature helps reduce the strain caused by these load surges. Kohler generators maintain outstanding power quality even in a home where power demands are fluctuating. Voltage regulation is critical because if the voltage is too high it can damage sensitive electronics such as the circuit boards on new appliances, LED TVs, computers and other technology. Conversely, when voltage is too low, it can affect motor performance on HVAC/R systems and shorten the life of the motor. Steiner service tech Garth Rossmiller explains to dealers how efficiently the Kohler generator works. In addition, frequency will affect motor performances and reduce efficiencies if the frequency does not match the motor’s frequency design specifications. The Kohler 20RESD, the generator used in the Live Load test, features the company’s patented PowerBoost technology that allows the stator winding to accommodate peak motor starting demand and prevent overloading conditions. Kohler generators handle those spikes in power without dropping power to other devices operating in the house. For more information, please contact your Steiner Power Systems application specialist or call (847) 956-3098 for more information.